Mod that adds the option to terraform planets to tomb worlds. 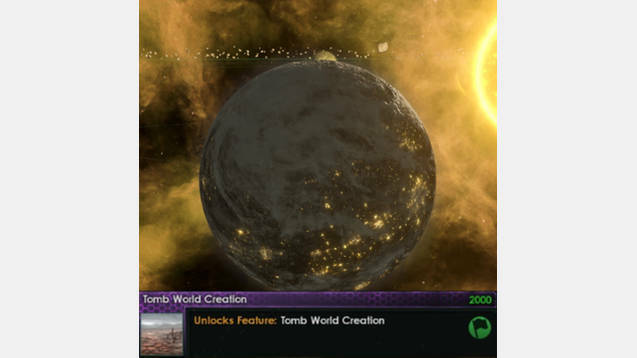 Once you research a rare tier 2 technology you get the option to terraform planets into tomb worlds. Tomb World Creation: “Through perfecting the doomsday technologies of the previous era, we can tomb planets, creating ecologically devastated worlds.” Allows players to tomb planets, creating ecologically devastated tomb worlds. Rare Technology: Tomb World Creation is a rare technology for those species who do not have a tomb world preference. Its rarity can be modified by having the right type of research leader or by taking the World Shaper ascension perk (if you have the Utopia DLC). It requires the player to have researched Terrestrial Sculpting and Nuclear Missiles as prerequisites. Human Player Only: Weight modifiers mean the AI will not be able to roll this technology. Should be compatible with any mod that does not enable terraforming to tomb world. No files were altered in the making of this mod. Reworked Planetary Diversity : this mod includes the ability to terraform to tomb worlds. Cockroaches of Earth: Simple prescripted empire mod to let you role play as the vanilla Stellaris Cockroach species from a tomb world Earth. Tombing Planets: Mod to allow the player to tomb planets, changing inhabited planets into tomb worlds and obliterating the colony. *Note from Author: This mod was developed thanks to the suggestion of @Niccolo for role playing purposes with my other mod Cockroaches of Earth and may not be balanced. Please let me know if you have any issues or suggestions.